Constitution of 1857contained many reforms; it ended slavery and forced labor, and limited the armys power in the government. Although it did not actually. 1 Constitution of 1857contained many reforms; it ended slavery and forced labor, and limited the armys power in the government. 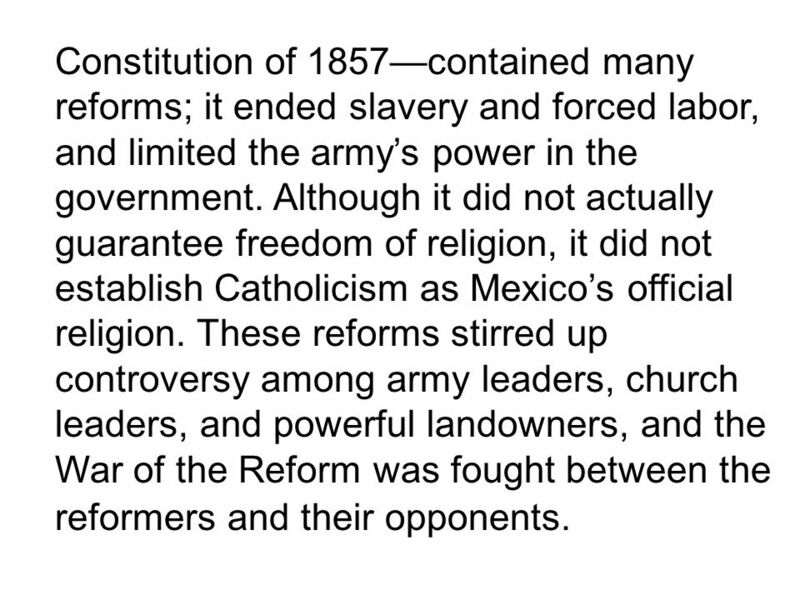 Although it did not actually guarantee freedom of religion, it did not establish Catholicism as Mexicos official religion. These reforms stirred up controversy among army leaders, church leaders, and powerful landowners, and the War of the Reform was fought between the reformers and their opponents. 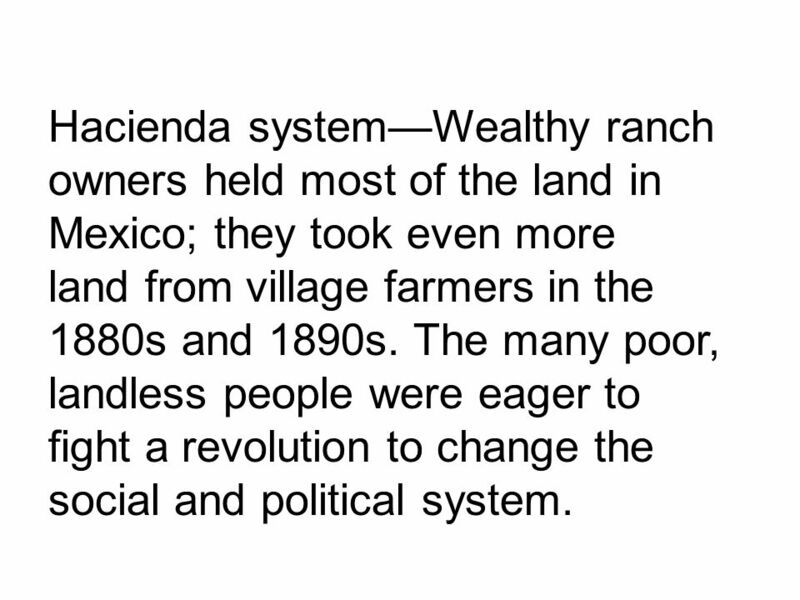 3 Hacienda systemWealthy ranch owners held most of the land in Mexico; they took even more land from village farmers in the 1880s and 1890s. The many poor, landless people were eager to fight a revolution to change the social and political system. 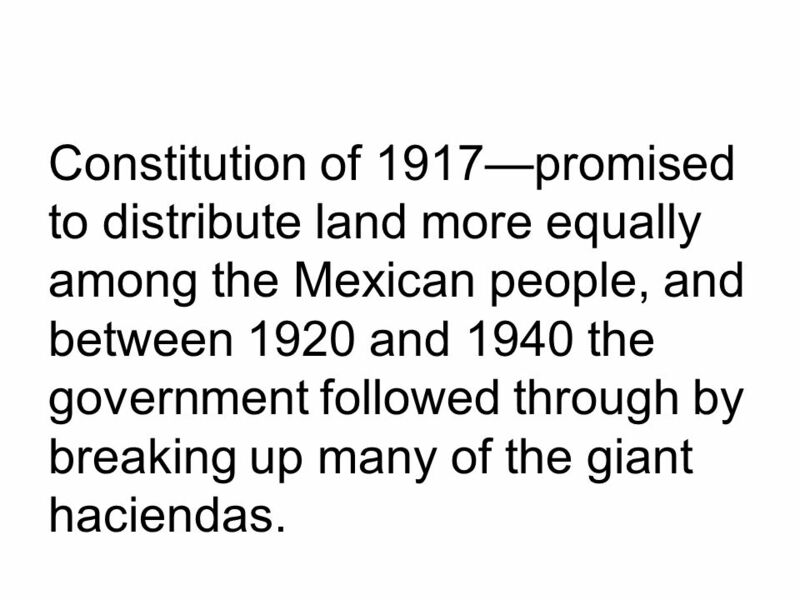 4 Constitution of 1917promised to distribute land more equally among the Mexican people, and between 1920 and 1940 the government followed through by breaking up many of the giant haciendas. 5 Benito Juárez was a leading reformer who became president of Mexico in 1858. The Mexican Revolution was a war from 1910 to 1920 among armies from many parts of Mexico. Leaders included Madero and Zapata; issues included honest elections and land reform. 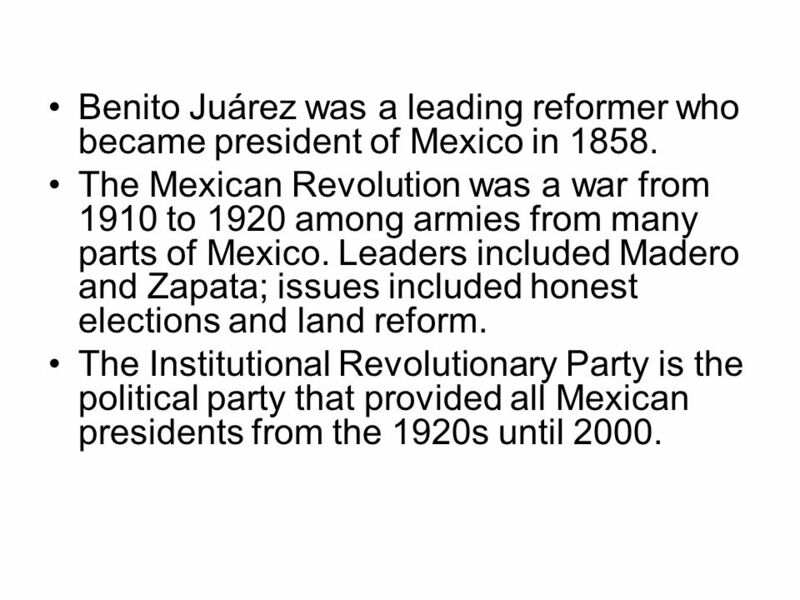 The Institutional Revolutionary Party is the political party that provided all Mexican presidents from the 1920s until 2000. Download ppt "Constitution of 1857contained many reforms; it ended slavery and forced labor, and limited the armys power in the government. Although it did not actually." POLITICAL, SOCIAL, AND ECONOMIC CHANGES IN LATIN AMERICA: By: Abby Gordon and Dickie Fairbanks. Do Now-What is the Message? HW: Create a one page biography of one of the following leaders. 1.Simon Bolivar 2.Jose de San Martin 3.Toussaint L’Ouveture. THE ANATOMY OF 19 TH AND 20 TH CENTURY REVOLUTIONS THE VARIOUS TYPES OF MODERN REVOLUTIONS. 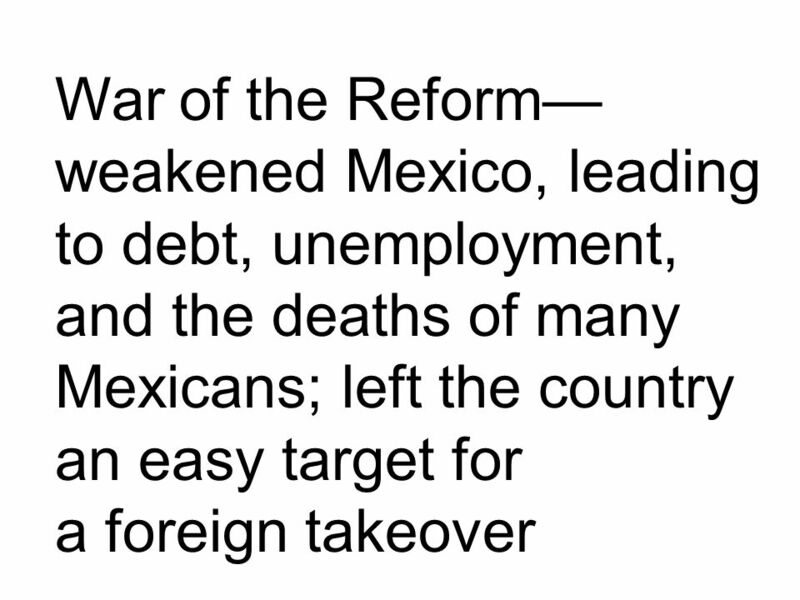 The Mexican Revolution By: Irene Atilano. The Political System Dictator Leader Porfirio Diaz –His federal constitution of 1857 had guarantee of Mexican. The Mexican Revolution A Presentation by Matt Greer and Katy Simmons. Mexico Land of the Aztecs. Latin America Includes all lands south of Mexico. Called “Latin” because most countries use Spanish as their official language.  Benito Juárez was born March 21.  He was born in San Pablo Guelatao, Oaxaca, Mexico.  Juárez was born of Indian parents, but both died. Tenochtitlan Capital of the Aztec Civilization. Porfirio Brooke Robbins Cara Rano Diaz. Biography Inspired by revolutionary soldier tales and set out to join national guard in 1848, but was too late. TEKS 8C: Calculate percent composition and empirical and molecular formulas. Revolution and Nationalism in Latin America.